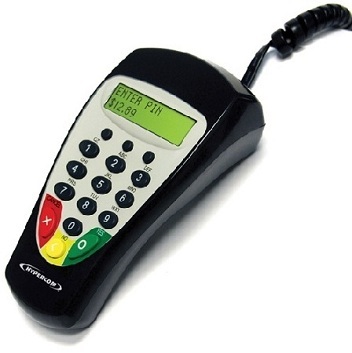 (NEW) Compact, comfortable and convenient: the S9 PIN-based payment transaction devices from Hypercom are simple to use and cost-effective, too. Look at it from your customers point of view. The S9's hand-fit and easy features maximize efficiency and responsiveness. It puts big number keys, colored OK and CANCEL keys, and a bright, backlit display right in the palm of their hands. Now see the S9 from your side. It meets every security and network integration standard – it's PCI-PED approved and triple-DES-capable. You get a choice of DUKPT or 12 master / session keys in one secure package. Three optional configurations let you move up to an integrated chip card reader, magnetic stripe card or combined chip / magnetic stripe card service. And its complete software makes for easy integration with your existing POS terminal or ECR system. Providing a secure solution for the most recent PCI mandates.